Well y’all, I’m here to tell you how much you need some grape jelly meatballs in your life. They’ve been a family tradition of ours for as long as I can remember, and I make them for any kind of holiday gathering we have. 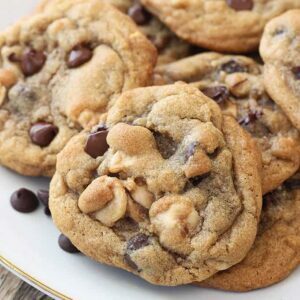 One, because they are probably one of the easiest things you will ever make, and two, they are out of this world delicious! 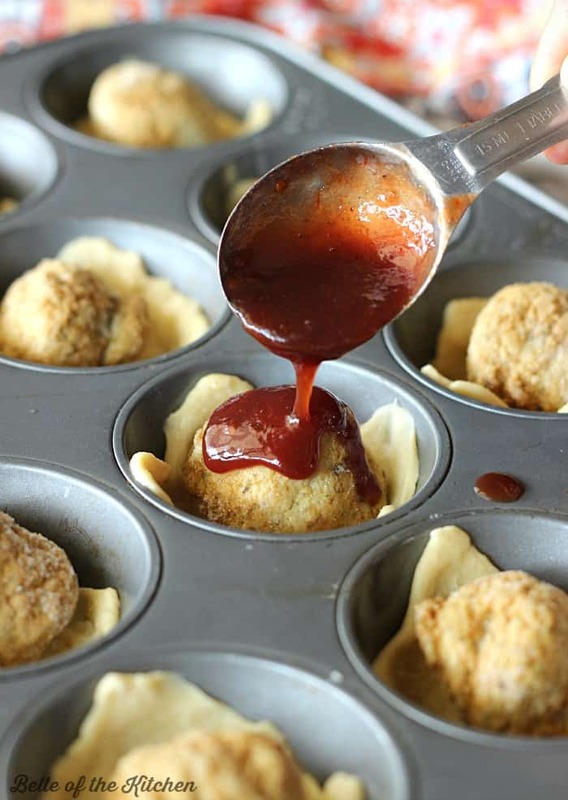 The main ingredients include grape jelly, BBQ sauce (or chili sauce), and frozen meatballs. I decided I wanted to try something new with the meatballs this year, so I tried to think up ways that I could improve them. As good as these meatballs are, they aren’t always the easiest thing to eat at a party. You have to scoop them out of the slow cooker for one, and then you need to have a plate and fork handy to eat them with. 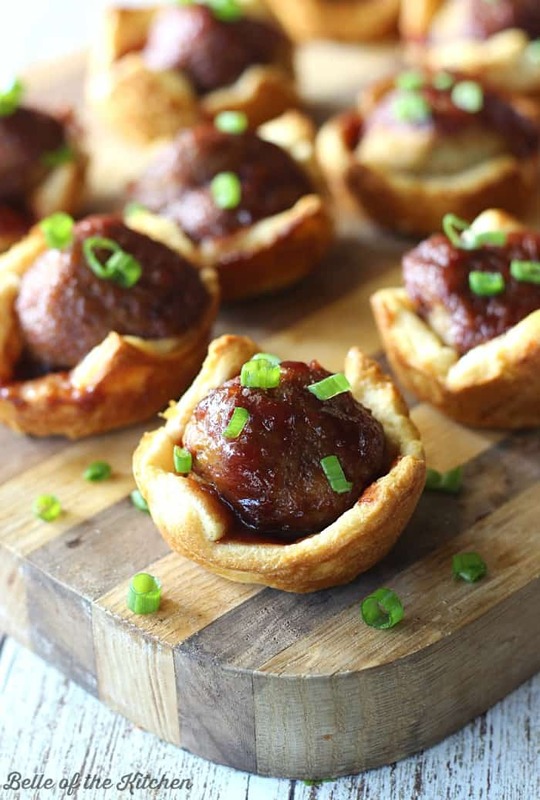 When you’re walking around mingling and chatting with family and friends, sometimes it’s easier to just grab and eat, and therein lies the beauty of these BBQ Meatball Crescent Cups! 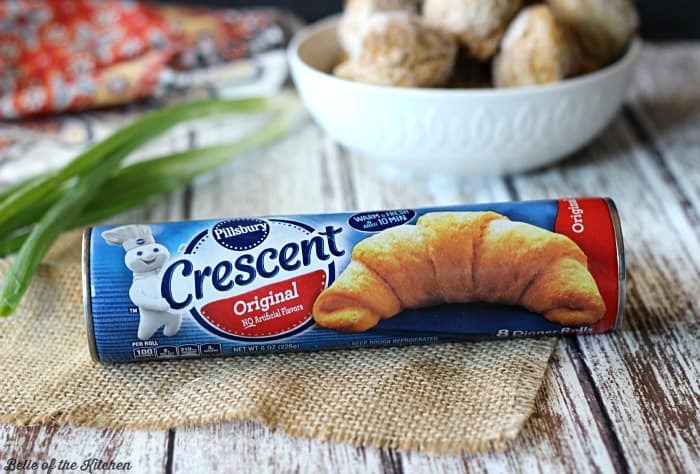 They are handheld and mess free thanks to the Crescent roll crust! I LOOOOOOOVE crescent rolls, like seriously adore them. There are so many wonderful things you can make with them, the possibilities are endless. I knew they were going to be the perfect way to take my favorite meatball recipe to the next level for the holidays! 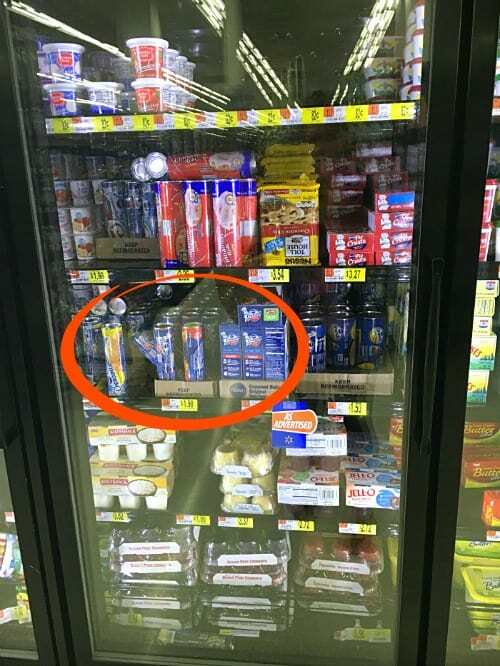 I picked up a few packages to make these on a recent Walmart run. 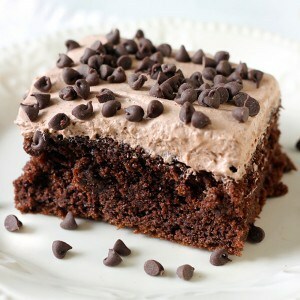 All you have to do is cut your dough into small rectangles, press them into the cups of a greased muffin tin, top with frozen meatballs and sauce, then bake in the oven for about 12-15 minutes. When you take them out of the oven, you are met with delicious meatball perfection. 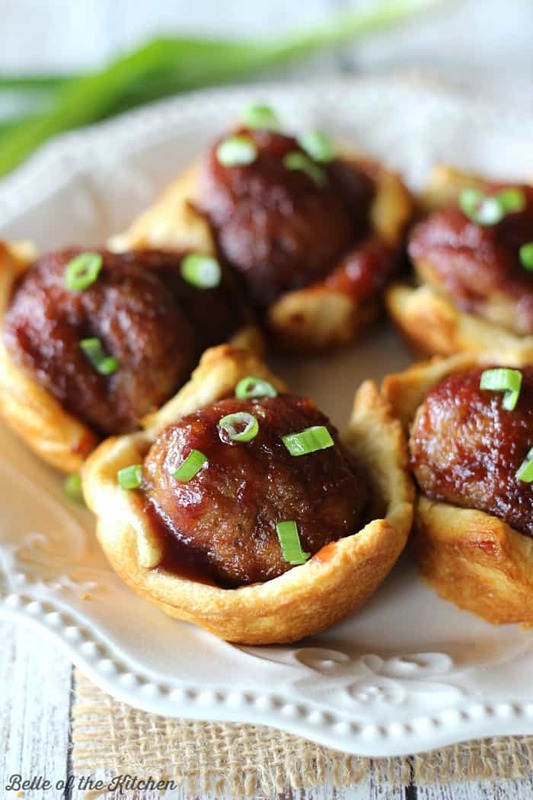 I don’t know why I haven’t been making meatballs with a Crescent roll crust all this time! BBQ Meatball Crescent Cups – Meatballs topped with a tangy sauce and baked inside a flaky crescent crust. This quick and easy appetizer is sure to please a crowd! Preheat oven to 375 degrees F. Spray two standard muffin tins with cooking spray and set aside. 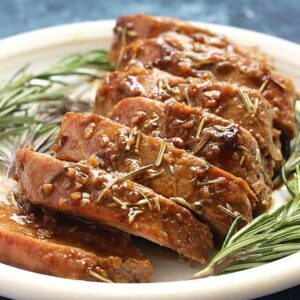 In a small saucepan, combine grape jelly and barbecue sauce. Cook over medium-low heat for 10-15 minutes, whisking occasionally until no lumps remain and sauce is smooth. While sauce is cooking, remove crescent rolls from packaging and form into 4 rectangle shapes. Press the seams together with your fingertips to seal. Take a knife and cut each large rectangle into 4 smaller ones. After you have cut all of them, you should have 16 smaller rectangles. Press each small rectangle into the prepared cups of your muffin tins. Press firmly into the bottom and up the sides, stretching the dough a bit as you go. Place a frozen meatball in each cup. Top each meatball with 1 Tablespoon of the sauce. 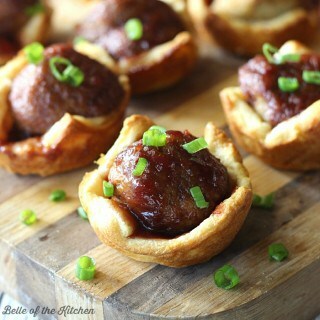 Bake in the oven for 12-15 minutes, until meatballs are cooked through and sauce is bubbly. 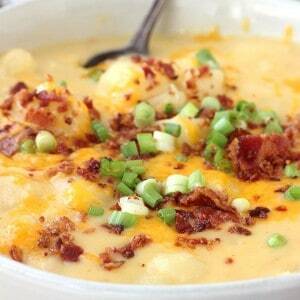 Top with sliced green onions and enjoy! *To remove these from the muffin pan, I used a sharp knife to separate the crescent roll cup from the side of the pan and then a fork to help lift them out.